The Al Jazeera collection of secret documents from US, Israeli and Palestinian peace negotiators, paints a highly negative picture of the three participants. We will need a biblical parable to help explain how these three governments fell so far so fast. “A London Guardian editorial captures the essence of US policy as it has been pursued since the first days of the Obama administration and indeed, since the first days of Israel 63 years ago: The Americans’ neutrality, the Guardian writes pointedly, “consists of bullying the weak and holding the hand of the strong”. Israel is the spoiled strong bully in the parable, the prodigal younger son. The US is the indulgent father who favors the prodigal for reasons known only to him. This indulgence has increased as the father holds the hand of the strong son, through the past three presidential administrations. The Palestinian Authority is the elder brother, the son who knew he was not loved by his father but still did what he was told to do. He stayed on the farm. Now that the prodigal has returned, in my reading of this version of the parable, he must endure his daily humiliation of bread and water while the prodigal eats his fill of fatted calves. The elder brother has been reduced to a pathetic stance of begging the prodigal son for enough crumbs from the table to keep his family from starving. What is the elder brother’s reward? His every begging act is made public through secret papers which reveal a cravenness no father ever wants his family to see. Like Noah of old, his nakedness is exposed to his family. The Papers, however, are not easily refuted. They provide facts that verify what observers of the peace process, including many Palestinians, assumed all along to be true. The papers reveal that Israel rejected the offer, which Israeli negotiators said “does not meet our demands.” This sounds very much like a negotiating team determined not to reach any agreement. It also sounds like a prodigal son who has come to love his sheltered life as the neighborhood bully. The Palestine Papers are a collection of almost 1,700 documents, obtained from unknown, possibly Palestinian, sources. They cover a decade of “peace process” maneuvering during the Bush, Clinton and Obama administrations. “We are in the middle of a political earthquake in the Arab world and the ground has still not stopped shaking. To make predictions when events are so fluid is risky, but there is no doubt that the uprising in Egypt — however it ends — will have a dramatic impact across the region and within Palestine. If the Mubarak regime falls, and is replaced by one less tied to Israel and the United States, Israel will be a big loser. As Aluf Benn commented in the Israeli daily Haaretz, “The fading power of Egyptian President Hosni Mubarak’s government leaves Israel in a state of strategic distress. Without Mubarak, Israel is left with almost no friends in the Middle East; last year, Israel saw its alliance with Turkey collapse” (“Without Egypt, Israel will be left with no friends in Mideast,” 29 January 2011). Indeed, Benn observes, “Israel is left with two strategic allies in the region: Jordan and the Palestinian Authority.” But what Benn does not say is that these two “allies” will not be immune either. John Barry, of Newsweek’s Washington bureau, wrote a “behind the scenes” report for the web site, Daily Beast, on developments in Egypt. “At a meeting on Friday afternoon, Obama and his top officials, including Clinton, Vice President Joe Biden, and National Security Adviser Tom Donilon among them, concluded that the time had come for Obama to talk directly to Mubarak. And Mubarak’s address to the Egyptian people had given Obama the opening he wanted. The White House organized the call. It was an intervention that dramatically—and publicly—escalated the American involvement in the Egyptian crisis. In an address from the White House, Obama outlined what he had told Mubarak, putting the administration unequivocally behind the demonstrators’ demands. And, said Obama, “we are committed to working with the Egyptian government and the Egyptian people—all quarters—to achieve” those goals. 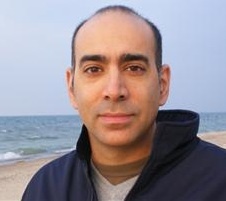 We are very much in the middle of what Ali Abunimah describes as “a political earthquake in the Arab world.” How President Obama deals with this “earthquake” is clearly the most challenging foreign policy danger, or perhaps, the most important foreign policy opportunity, of his presidency. He made an excellent beginning in his dealings with the Egyptian crisis, especially with what many will interpret as his willingness to talk to all parties in Egypt, including the Muslim Brotherhood. Does that suggest Secretary of State Clinton will now be instructed to bring Hamas into discussions with a badly wounded Fatah? As Wall Writings prepares to enter its fourth year on line (April 24, 2008 was the launch date) our Wall Writings Alert mailing list continues to grow with new readers who receive our alert emails. Other readers receive an alert, not from Wall Writings, but from helpful readers who forward the alert to their own mailing lists. Sabeel has been an especially valuable ally in forwarding the alerts to its readers, for which we are most grateful. 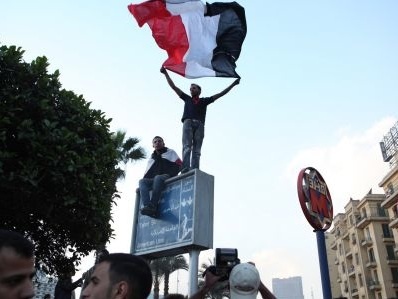 The picture at top of Egyptian young people in Cairo was taken by Matthew Cassel. It is from Electronic Intifada. The picture above of Ali Abunimah is also from Electronic Intifada. This entry was posted in Middle East, Religious Faith. Bookmark the permalink. The foreign policy of the United States toward Israel since the early years of the Cold War, has ignored the admonitions of George Washington in his farewell address on foreign policy in general. When Thomas Jefferson and James Madison took sides between the British and the French, the United States became involved in the War of 1812, nearly lost independence, and would have deserved such loss if the Duke of Wellington had not taken a kindly view of our foolishness. If the United States does not take a policy of friendly neutrality between responsble Arabs and responsible Jews in the Middle East, we shall richly deserve the tragic consequences. Americans will suffer, but so will the world. This article teaches that lesson as well as any I have read. — John Remington Graham of the Minnesota Bar (#3664X). Excellent review of recent events – EXCEPT – Obama’s silence on the middle east situation in his State of the Union address on Monday night. One can understand that he didn’t want to irritate powerful Israeli interests in both political parties at a time when he needs their legislative support, but it seems to many of us that the Israeli-Palestinian situation is a major factor in our State of the Union and deserved mention and commitment to action. Only the events in Egypt drew him out. Shame. Thank you, Jim, for sharing this analysis. The Scriptures do not tell us how long the Prodigal Son’s father was willing to put with his conniving. Apparently forever. This patterns the American administration’s (whatever the party in power) willingness to put up with the Israeli government’s intent to control not only the Palestinians but also the whole of the MIddle East. Mark Braverman, in his book, Fatal Embrace, is convinced that Zionest ideology (through AIPAC) controls the “peace process” which controls Congress. Just what is it that our government fears? AIPAC? If so, why? The present Egypt chaos may have more effect on the Israel/Palestinian conundrum than anything else, and indicate that real change is afoot. Those young men (and women?) who have college degrees, but are unemployed are ready to step on the stage of history. They need our support, without Mubarak in the picture. Palestine should be declared an independent state and recognized by the United Nations. One hundred and ten countries have given backing to an independent Palestine. Let’s all sign a petition and get independence for Palestine. Include the 1967 borders for the West Bank, the Gaza Strip, and East Jerusalem. Then Israel can be a secure nation. What a joke. Now Mr. Obama is trying to save face. This is amasked manauver to show the world that the US is behind Democracy etc. All of us who know the motive behind his speech realize this is only a sly fox is talking, we know the clear truth behind his stand and those behind him, his zionist advisers. For the last two years he supported Mubarak rgeime unequivically. So now when the earth is shaking under the US and Israel’s clones in the Middle East countries, Obama is advocating the rights of the people of Egypt for free election and Democracy! !